The Jungle Book, based on the stories by Rudyard Kipling, has had multiple film and TV versions. What’s new about Jon Favreau’s new film is the fantastic use of CG technology that makes it possible to create a dense jungle in a studio and a cast of meticulously created wild animals, with Neel Sethi as Mowgli being the only real human in the cast. The film has an international version voiced by stars like Ben Kingsley and Idris Elba and a Hindi version with shuddh desi voices and accents. The translation has some oddities—raktphool for fire, for one-- but kids would love it for its humour (sometimes rather forced) and the breathtaking visuals. Mowgli, as generations of kids have read, is a man cub (insaan ka bachcha), who was found by Bagheera the panther (voiced by Om Puri) and raised by a pack of wolves. Shere Khan (Nana Patekar) sniffs out the human in their midst and wants to devour him—his burnt face only adds to his hatred for humans. Later, a flashback reveals how Mowlgi’s father was killed by Shere Khan, and also explains how the kid has on a red loin cloth in the jungle. 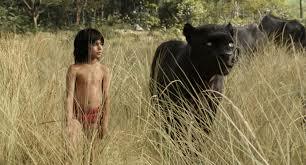 Mowgli is a hyper energetic kid, loved by his wolf mother (Shefali Shah) and cuddly cub brothers. But to protect him from Shere Khan, they send Mowgli towards the “insaanon ki basti” outside the jungle. On the way he is attacked by Shere Khan, saved by a bull stampede and ends up romping around with the honey-guzzling Baloo the Bear (Irrfan), who speaks with a Punjabi accent. But all little flaws—it does gets tedious in places-- are eradicated by the magical visuals plus the incredible cuteness and energy of Neel Sethi. Another version of The Jungle Book directed by Andy Serkis is under production right now (to be out in 2018)—it will have to match or better the CG achievement of this one. A tough task.